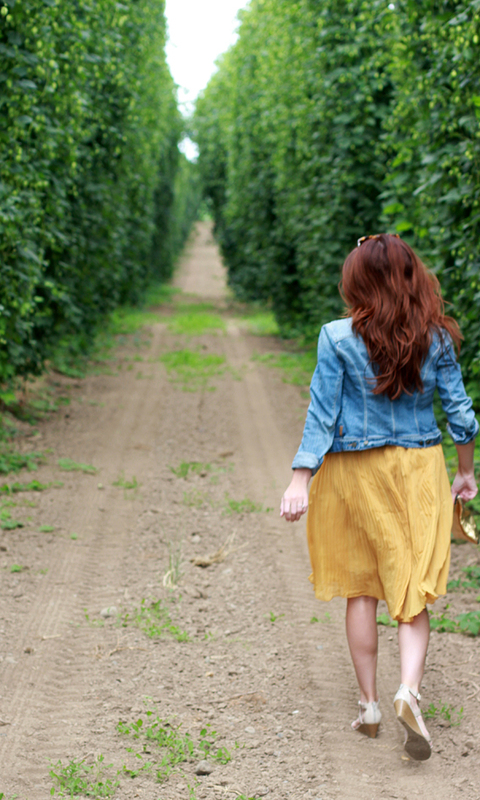 We were driving back from Portland when the sweet smell of hops filled the car. I knew that my boyfriend used hops for brewing beer (which I love), but had never seen one of these cuties in the flesh. After coercing Ty to pull. over. the. car. I jumped out & breathed in the sweetest, funkiest scent. Fresh hops. Little pinecones of joy. Mmmmm I love hops! So cool that you came across fresh hops while driving! I absolutely adore this skirt! And these photos are so cute! Very nice background for blog photos! Thank you for stopping by and commenting on my blog. Such a cute outfit. HAHA, that pic with your hair flying everywhere is awesome! Cute skirt! 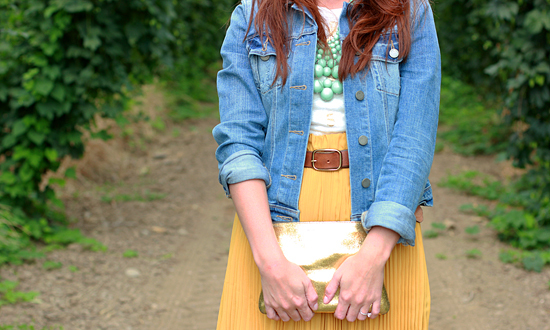 really love that skirt - i never wear yellow but it's such a fun color and looks great on you! What a pretty pleated skirt! These pictures are so adorable and filled with joy! I love it. Your outfit is super cute, I am really digging that skirt and I always love a denim jacket! Great pictures, and what an adorable outfit. Love the skirt! How fun! I don't think I have ever smelled fresh hops...guess I must try! I love how the pictures turned out....the background is gorgeous and that outfit is so perfect for it! You're making me want a beer. And a yellow midi skirt. love that skirt worn like that! and what a pretty background! 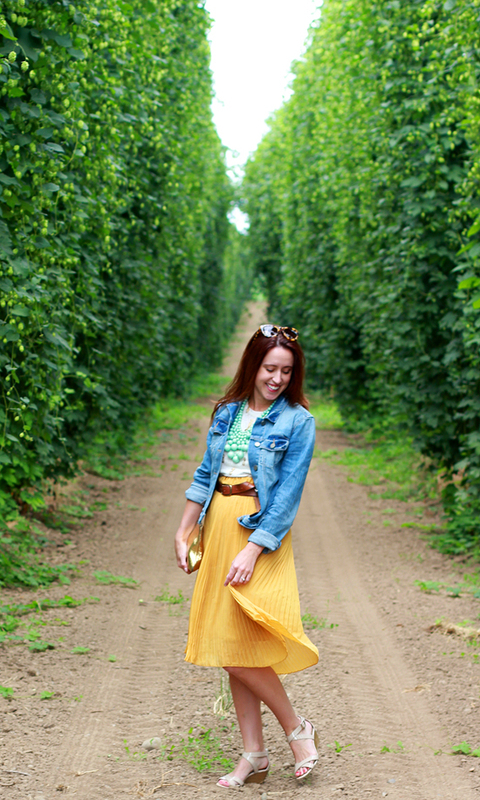 I don't really know what hops are, but the area looks gorgeous and you look like you had so much fun! I'd definitely be twirling about as well! :D Your hair looks so pretty too! Perfect fall outfit! 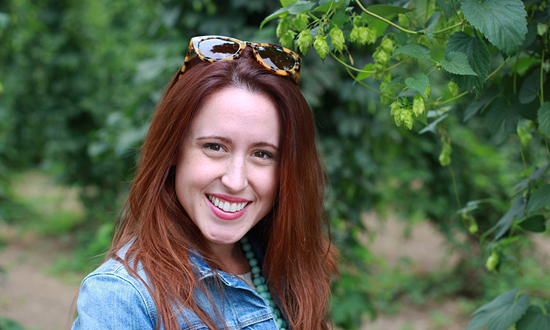 I am really going to try to find myself a well-fitting denim jacket this season! Wish me luck! so cute and such gorgeous pictures! I love the smell of hops! Also, love that skirt! Love the sunnies! They are so sophisticated and will transition nicely into fall! love your dress! The photos are amazing!